Swapping tires is a regular point of maintenance for car owners, but with such a wide selection of types, sizes, and prices, choosing the right tire for your Honda can be a confusing task. Keep reading, and save yourself the trouble of searching countless web pages in your search to find the best tires. We’ve done the work, so you don’t have to. 1. When Do I Replace My Tires? Tires are the only buffer between the tonnage of your Honda and the asphalt below. Through either age, use, or the decomposition of the tire’s rubber, the tread will become less effective at gripping the road over time. And if not thoughtfully replaced, your Honda’s tires will become outright dangerous even in prime driving conditions. A classic test of a tire’s tread requires only a quarter. Slip the coin in a groove between the raised rubber treads. If you can see the top of Washington’s head, that’s a good sign that it’s time to start shopping for a new pair of tires, as the tread has become worn down to the point of reduced performance. Passing the quarter test however, does not mean your tires are still road safe. Tires with low mileage may retain a significant amount of thread but can be dangerous in different ways. It is recommended that tires five years or older receive yearly inspections from qualified mechanics. Rubber decomposes over time, especially if left in the heat or extreme weather. When tires are ten years or older, most mechanics agree that they should be immediately replaced. Don’t know the age of your tires? Hairline fractures along a tire’s tread is indicative of an older, aged tire. If these fractures are present along the sidewall of a tire, we recommend replacing them immediately. The rubber along the sidewall is quite thin. While the treads may still guarantee a steady grip for your vehicle, aged tires have a likelihood to pop, tear, or deflate, and put you at risk of an accident or injury. Unfortunately, determining if your tires should be replaced is the easy part. Choosing them is much more complicated. To identify the tire measurements that are right for your Honda, check your owner’s manual to identify the OEM (Original Equipment) tires that came with your vehicle. This information can also be found on your door jamb. Let’s say your tire measurement is 220/50R14 98T. The first number of this sequence, 220, represents the width of the tire, measured in millimeters. Following the hyphen, the second number, 50, is the aspect ratio. It’s a percentage that measures the tire’s height compared to its width. Lower aspect ratios generally offer smoother rides, but are more susceptible to pothole-ridden roads. The letter that follows our ratio is the tire’s construction. Either R or D, this represents how the tire is layered. Lastly, and most importantly, the final number of the sequence is the diameter of the tire, measured in inches. So our tire is 14-inches wide. When choosing new tires, make sure they match the tire size measurements. The second pair of numbers and letters from our example, 98T, represent the load index and speed rating. The load index is a measure of the weight the tires can carry. Never purchase tires with a lower load index than your OEM tires, as they may struggle to carry your vehicle. The speed rating from our example, T, is the top speed of a vehicle with these equipped tires. Tires with better speed ratings offer better performance, but also lower lifespans and higher costs. The most important tire-buying decision relies not on the size or measurements of the tire, but instead on the type you choose to purchase. Since it is recommended to purchase tires with the same tire measurements, this is the main and only decision for typical car drivers. The best type of tire will depend on your weather and road conditions and typical mileage. All-season tires: The most popular tire choice for typical car owners, all-season tires are a middle-of-the-road compromise between grip, speed, and mileage. Winter tires: Car owners who live in snow-laden states may find value with this type of tire. They are manufactured with more slits on their threads to optimize braking and handling in deep snow situations. Because they wear quickly, it is recommended you replace them at the end of winter to maximize their lifespan. Summer tires: These tires are mainly used for high-performance vehicles. They have fewer grooves and more shallow treads, so more rubber grips the road and provides enhanced braking and cornering. All-terrain tires: A simple choice for four-wheel drive vehicles. They are designed for off-road exploring and back roads and are more resistant to popping. Have your eyes on a new set of tires, but you’re unsure of the quality or performance? Most tires must undergo grading standards by the U.S. government. Known as Uniform Tire Quality Standards, it’s a great source to quality-check tires. Read to Replace Your Tires? Now that you know how to choose tires, you’ll need to decide on the best type for your driving needs and have them installed. But you’ve done enough work already. 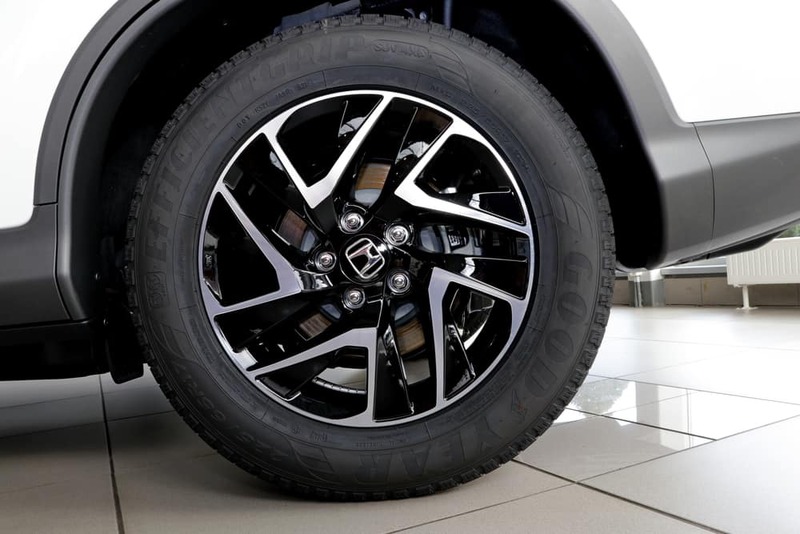 Let us handle the hard part and replace the old tires of your Honda vehicle. We offer a variety of service specials to make routine Honda maintenance easy and affordable.